Kanye West recently disclosed to France’s Clique TV that the School of the Art Institute will grant him an honorary doctorate during their May commencement ceremony. Walter E. Massey, President of the School of the Art Institute of Chicago, invited West on March 4 through Twitter. As of the writing of this essay, the news has been confirmed by a variety of sources, including the Chicago Tribune. Full disclosure: I am pursuing a PhD, hoping to get my own doctorate in the fall. At first when I heard this, I rolled my eyes so hard they almost flew out of their sockets. I like Kanye West’s music enough, but I’m no super fan. I’m not directly affiliated with the School of the Art Institute, but I’m close with many who are. I usually avoid tabloid press, but the honorary degree rumblings piqued my interest when I noticed the art blogs picking up the story and running with it. Then my Facebook feed lit up. I read countless responses from people defending the decision, deriding it, or simply questioning its veracity. Even while writing this, my opinion changed several times. Regardless, the whole issue seems to have hit a nerve amongst artists, and certainly the art community in Chicago. Why is this? 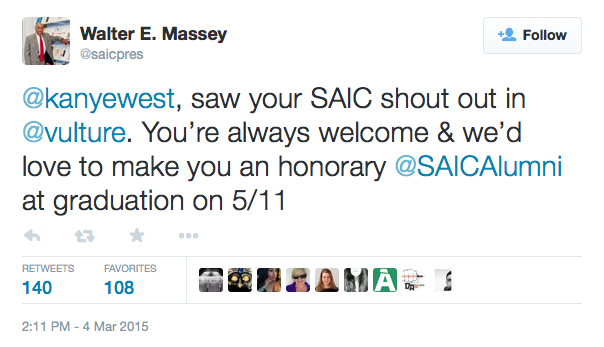 What is it about Kanye West and the School of the Art Institute that we feel this kind of immediate gut reaction? Why the vitriol? How can we approach this critically, getting to the heart of the real crisis here—that is, if there is one at all? Q: Does an honorary doctorate mean the same thing as a “regular” doctorate? A: Of course not. Next. Q: Does it matter than West never went to the School of the Art Institute when he was a Chicagoan, but instead went to the American Academy of the Arts and was—supposedly—a Columbia College Chicago dropout? 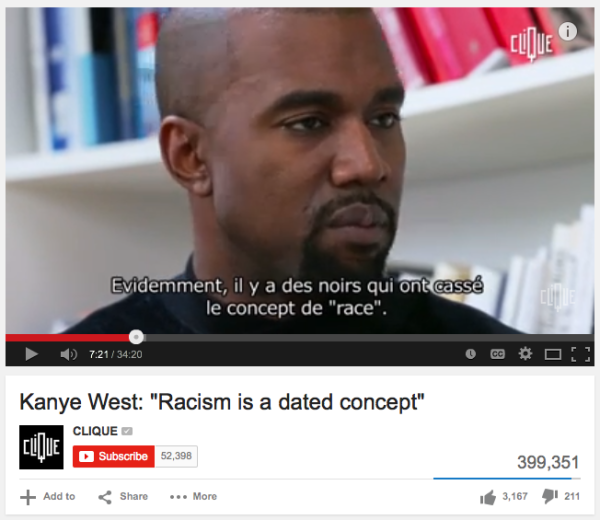 Q: Is what Kanye West does “art”? A: Maybe—Yes—No—ugh, are we still asking these kinds of questions? Q: Should an institution that does not grant doctorates be able to confer honorary doctorates? The tradition of giving honorary doctorates has been around for a very long time, at least as long as the institutional convocation ceremony turned into an opportunity to invite prestige guest speakers. Many public figures have been awarded honorary doctorates for any number of reasons. The School of the Art Institute has in fact awarded many honorary degrees; last year’s recipients were Theaster Gates, Ellen Sandor, and Franz Schulze. Gates, of course, is a well-known Chicago-based artist and educator, and Sandor and Schulze are both Chicago-based and heavily associated with SAIC. Many of the higher-profile past recipients have some sort of Chicago connection, or had even attended SAIC: for example, Apichatpong Weerasethakul (director of Uncle Boonmee Who Can Recall His Past Lives) received an SAIC MFA in 1998; Gahan Wilson was born in Evanston; Eric Fischl worked at the Museum of Contemporary Art as a security guard in the 1970s; Jeff Koons also attended SAIC before moving to NYC to become a commodities broker. However, not all honorary recipients are affiliated with Chicago or the Art Institute at all: Patti Smith, for example, is most associated with New York (have you read Just Kids yet? You have to read it). Yoko Ono’s closest Chicago connection is that she headlined the Pitchfork Music Festival in 2007. So why is Kanye West different? He has a strong Chicago connection. He is a wildly successful recording artist. He’s shown himself to be a fascinating figure in the visual arts, to say the least. Clearly it’s not so much that West’s work isn’t worthy of recognition, but seems to be an issue of what he represents. 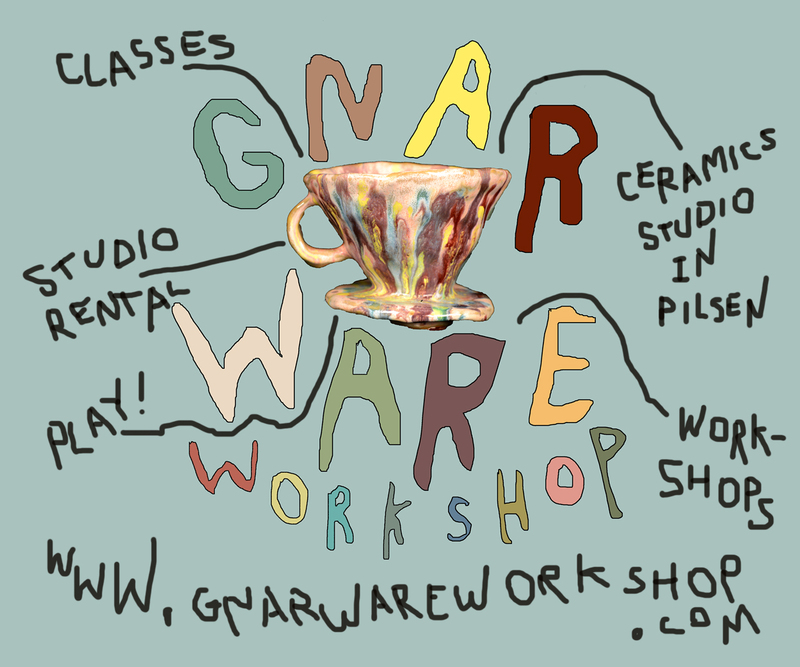 It brings up some really interesting questions regarding trends and kinds of art practice, particularly the business of art versus the more locally-recognized radical politics of social practice that begins in so many graduate programs. It brings up some interesting comparisons between the practices of more recent honorary recipients—Gates et al.—and the multifaceted work that we’ve seen from West. Many have read that statement as being far too flippant about race. But should we pillory West for his reaction to conversations about racism? It is old-fashioned. It is embarrassing that we still have to talk about it. And, yeah, it is stupid—not because race doesn’t exist, or that it isn’t still an incredibly embattled and complicated issue in America, but because racism as a concept is itself is a shorthand that allows us sidestep conversations about alienation and segregation. Kanye West is tired of talking about it, and doesn’t want his work simplified in such a manner. Can you blame him? Is this dismissal of racism part of the problem? Is it because West refuses to become an advocate, a definite voice against racism, and instead dares to focus upon a more autobiographical practice, that he is so often defined as self-absorbed and vapid? Perhaps there is something in the fact that West is still relatively young, and often taken to task for being without the sort of self-reflection that seems to come with age. Perhaps it’s because he announced the degree conferral himself before it was announced officially, and in that announcement, seemed to intimate that he feels he deserves it. Perhaps he didn’t seem humble enough. Perhaps it’s because he’s black. Perhaps it’s all those things, and because he’s black. Since many who are better equipped than I have taken on the issue of Kanye West and race, I propose that we not make this a question about him, his work, or the fact that he may be receiving an honorary degree—besides, if you were offered an honorary degree, would you say no?—and instead interrogate the motives of the honorary degree-granting institution. How/why should an art institution confer honorary doctorates, and what does that mean symbolically for the institution? And more importantly, what values and attributes does this privilege, and who does it privilege? 3) How does such a high-profile awardee persuade or dissuade matriculation and/or individual and corporate donation? 4) What communities/hegemonic structures does/should an art institution actually serve? 5) What does the conferral of honorary degrees mean for art institutions in general, and does this have any real impact on art education, practice, and discourse? In the meantime, I’ll be over here, listening to Graduation. 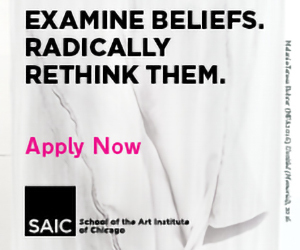 * Undergraduate tuition for SAIC, as of Fall 2015, is $43,140 for the year.